Mexican heather plants thrive in the hot Texas climate and are appreciated by many gardeners for their relative low maintenance. Their leaves have a soft, fine texture and create dense foliage in a shrub-like formation. Mexican heather plants reach 3 feet in diameter and about 2 feet tall. Its small, purple flowers attract butterflies and bloom throughout spring and summer. Mexican heather cannot survive freezing temperatures but occasionally makes it through the mild, Texas winters. 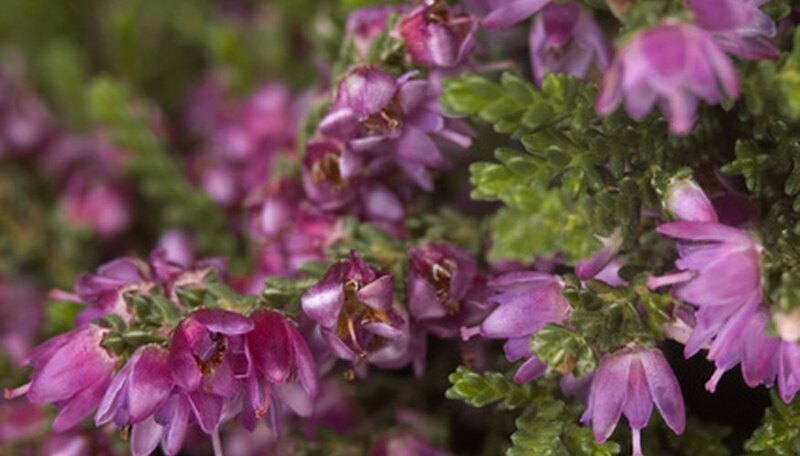 Plant Mexican heather in an area with partial shade for protection from high heat. Though Mexican heather can tolerate full sun, its leaves will almost certainly fade to a light shade of green in the hot Texas summer. Select an area with fertile, well-draining soil. Space each plant at least 2 feet apart. This will provide enough room for growth and air circulation without leaving any noticeable gaps between your plants. Water Mexican heather on a daily basis, especially during the dry Texas summers where temperatures regularly top 90 degrees F. Reduce watering to once every 1 to 2 weeks in the winter. Fertilize your plant with a slow-release formula in late winter, spring and summer. Follow the package directions so as not to damage your plant. Trim two-thirds of the foliage off your plant in late fall. Mexican heather cannot survive freezing temperatures, but may come back in spring after a mild Texas winter. Propagate your Mexican heather by taking 4- to 6-inch stem cuttings and rooting them in water. Mexican heather is toxic to dogs and cats.